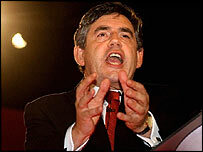 The coming year offers a "once-in-a-generation" chance to eradicate global poverty, Chancellor Gordon Brown said. He told BBC Radio 4 that the UK had led the way on debt relief, but admitted a new approach was needed to improve aid. His goals for the UK's EU and G8 presidencies include doubling aid from donor countries and eliminating debt owed by the poorest nations. A number of charities have formed the Make Poverty History campaign to urge the government to do more to help. Speaking on the Today programme, the chancellor said: "We shouldn't have to choose, as we are at the moment, between the temporary emergency relief that we are giving...and the long-term tackling of the underlying causes of poverty." He said richer nations "need to be able to do both". In order to make this possible, he called for "a very substantial increase in resources", which would be " akin to the Marshall Plan of the 1940s". The chancellor said a doubling of international aid was needed. Mr Brown also hailed the Make Poverty History coalition and the "huge groundswell" of support from faith groups, along with the work of high-profile campaigners such as Bono and Bob Geldof. Despite outlining his plans for the future, Mr Brown stressed that the UK had already worked towards the eradication of world poverty. "We have tried to respond by trebling over 10 years the amount of aid," he said. And, stressing the influence of the UK over other countries, he added: "We led the way with 100% debt relief for the individual countries. "Now there are 27 countries instead of one receiving debt relief." The chancellor said Britain's proposal for an international finance facility to borrow money on international capital markets was crucial in the bid to tackle global poverty. U2 singer Bono used his slot as guest editor on the Today programme to champion the Make Poverty History campaign and demand an end to "extreme poverty". "Our generation wants to be remembered for something more than the war against terror or even the internet," he said. "Just as they pulled down the Berlin Wall and drew back the Iron Curtain and ended apartheid, these seemingly impossible hills can be climbed." The rock star and global activist added: "It might take 20 years or 40 years but I really believe we can be the generation that turns this shift of indifference around." Bono addressed the Labour party conference in September, where he urged the chancellor and Prime Minister Tony Blair to work towards an end to world poverty and the Aids crisis.